I was just thinking those very words. 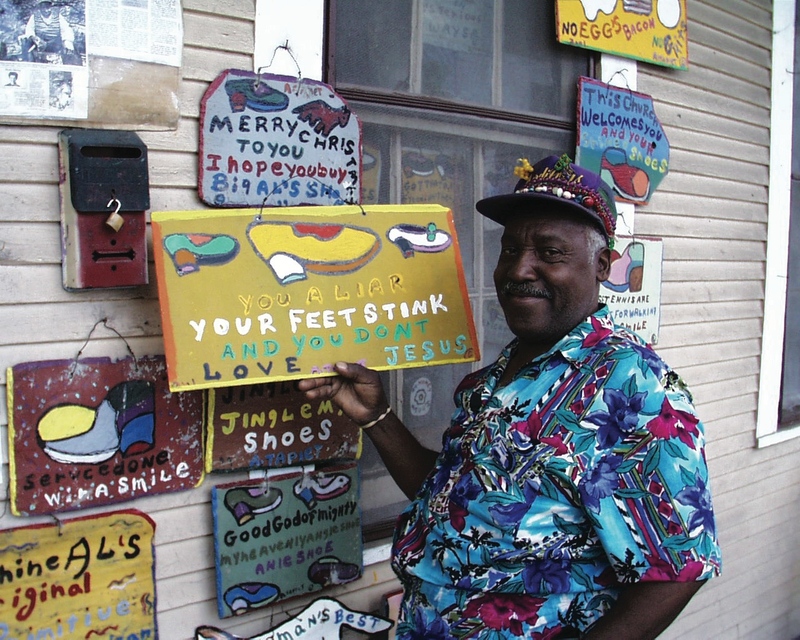 Al Taplet is a guy who shined shoes and lived in the Sixth Ward of New Orleans. Big Al, as they call him (though he really wasn’t all that big), dispenses wisdom (when he’s not polishing leather) on slate roof tiles and just about anything else that will stand still long enough to be painted. 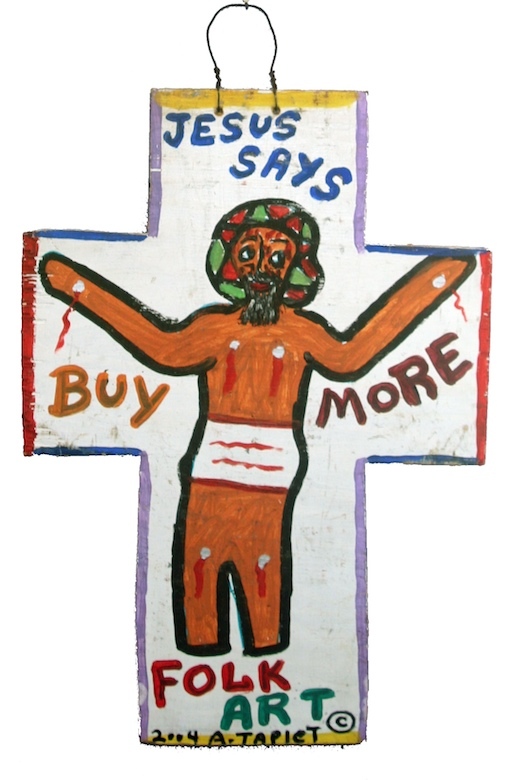 He claims his work is neo-primitive African-American street art, but to me it seemed mostly like plain old good, sound advice. 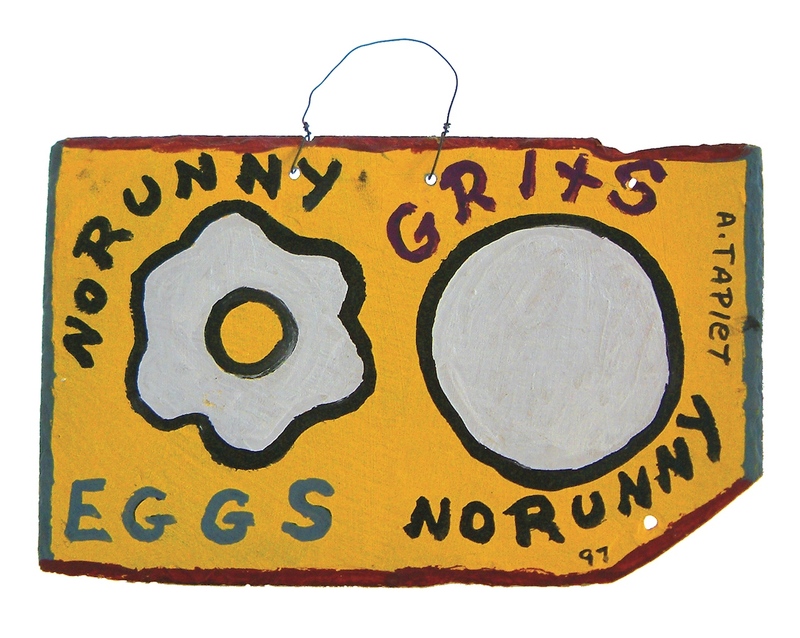 His art started as utilitarian, then it took on a life of its own, making Al much more money than shining shoes in New Orleans’ Jackson Square. After Katrina hit, Al and his twin brother (aka “Little Al”) survived and moved to Houston, TX from New Orleans, LA. As of May, 2012, the brothers are still making art and sharing an apartment there. The Taplet brothers were at Big Al’s house in the Sixth Ward when the water started to rise. It was Tuesday, Aug. 30, the day after Katrina had made landfall, and they believed they had weathered the worst of the storm. But suddenly, muddy water began pouring into the house from every direction. In less than an hour it was chest-high. Later that day an Army truck picked up the Taplets and their neighbors and took them to the Superdome. There they learned a Lake Pontchartrain levee had collapsed and that their homes were probably destroyed. For the next three days the Taplets endured the Superdome’s heat, stench and chaos, and waited for the buses they were promised would evacuate them to Texas. Neither of the brothers had ever been to Texas, but they decided that if they made it here, they’d stay for good. Katrina was merely the latest of their complaints against New Orleans: crime, crooked politicians, rude neighborhood kids. After three days, officials herded the entire population of the Dome outside to board the evacuation buses. Because they’re both old and diabetic, they were told they’d be among the first to leave. But by 3 p.m., not a single bus had arrived. The crowd was growing impatient, pushing and shoving against each other “like a bowl of maggots,” remembers Little Al. To head off a riot, National Guardsmen fired shots in the air and ordered the crowd to lie prostrate on the ground. Hours later, when the buses finally rolled up, another riot almost broke out as people fought for seats. The Taplets were separated. Little Al lost his insulin. And the brothers ended up on separate buses. Little Al’s bus arrived in Houston late that night but was turned away because of overcrowding at Astrodome and forced to return to Louisiana. On that leg of the trip, Little Al’s blood-glucose level rose too high, and he passed out. The next thing he remembers is waking up at the Baylor University Medical Center at Dallas. Meanwhile, Big Al had checked into the Astrodome and received a medical exam and was wandering the food court early the next morning when a volunteer approached him. Larry Gray, a commercial real estate broker, had driven to the Astrodome after work the day before to see if he could help. He’d spent the night running errands for other volunteers and was looking for something more meaningful to do. Gray asked Big Al if he’d like to spend the night at a hotel. Sure, Big Al said, so Gray put him up in Room 709 at the nearby Holiday Inn. Learning that the hotel had rooms to spare, Gray saw an opportunity to reduce crowding at the Astrodome. He told the hotel manager he’d pay for rooms for the neediest evacuees, figuring that FEMA would eventually reimburse him. (He’s still waiting for a check.) He ended up supporting about 50 people in 15 rooms. Sitting in his hotel room alone, Big Al worried about Little Al, and the news that another evacuee had discovered Little Al’s wallet was no comfort. But after almost a week, Gray relayed good news from Dallas: Little Al was alive. Gray and an evacuee headed to Dallas to retrieve him. Just before they left, a couple of Gray’s friends, Melissa and Charles Hall, stopped by the hotel to drop off some clothes and were introduced to Big Al. At a family meeting the next day, the Halls decided to invite the two Als to stay at their house. When Little Al arrived in Houston Sept. 8, the family had a bed made up for him. For the 5 1/2 weeks that they lived with the Halls, the Taplet brothers slept in the vacant bedrooms of the Halls’ two college-age children, ate dinner at the Halls’ table and watched Tivo’d episodes of favorite shows — The Three Stooges, The Mary Tyler Moore Show and Matlock — on the Halls’ big-screen television. When the Als weren’t painting, they played a card game called Tonk for hours at a time in the Halls’ garage. When he first met the family, Big Al had mentioned something about painting. No one took him seriously. A few days after the Taplets moved in, Melissa, on a whim, Googled “Big Al Taplet.” The search returned more than 300 hits, with dozens of Web pages devoted to Big Al’s life and art. 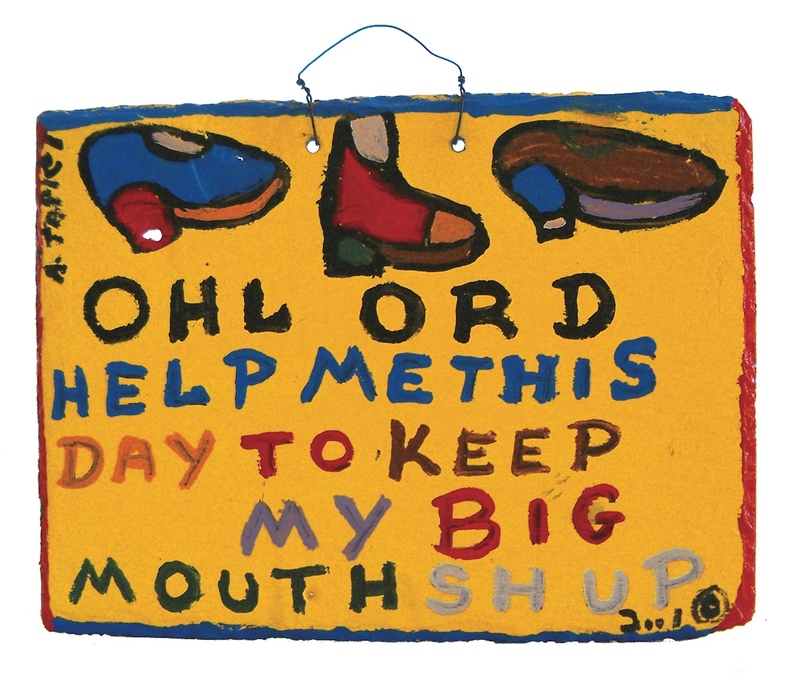 She learned that Big Al was featured in two reference books, Contemporary American Folk Art: A Collector’s Guide and Outsider, Self Taught, and Folk Art, and that his art was being sold around the world through the Web site of Primitive Kool Art, a San Diego gallery. Melissa became Big Al’s de facto manager, building him a garage studio and promoting his art to the Houston community. Graziano Roofing donated 50 slate tiles to Big Al so he could continue painting on his signature medium. Managers at Sprint, Whitney Bank and CVS Pharmacy bent the rules to get the Taplets new cell phones, bank accounts and prescriptions. 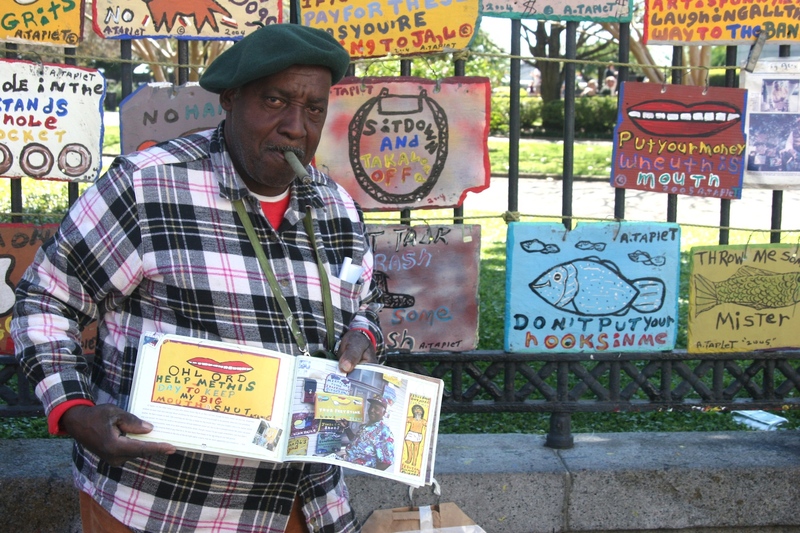 And with the help of one of Melissa’s neighbors, Big Al got his first official Houston exhibition. Post-Katrina, Al softened his opposition to dealers because he needed the money. But Melissa never asked for a cut of Big Al’s profits. He had finally found the perfect manager.